Ok. So I am not exactly on the ball with my resolve to “post more often”. But let’s give a girl a little room to warm up shall we? I promise (oh fate-tempting word that…promise!) to do my utmost to gain momentum this month! Meanwhile, let me go ahead and progress on the “using more leftovers” front. One of the most common holiday leftovers is ham. Even a dyed-in-the-wool pork lover like me finds herself on the other side of the holiday season with just little too much ham for comfort, and a spouse that is flatly refusing to have anything to do with it. Well, well, well, I wasn’t going to let a perfectly good last bit of smoked and cured pork go to waste, even in the face of of doubting husbands and laments of no-please-not-another-ham-sandwich! And I think I may just have found the perfect way to revivify it. This is, without a doubt, up down and sideways, my kind of dish. I love cabbage. LOVE. Seriously. I can eat cabbage til the cows come home. I haven’t a clue why it has earned a bad reputation in certain circles. I will eat it in all manners of preparation and then some. But gently simmered in cream? With tender-toasty bits of ham infusing everything in a robust porky smokiness? Punctuated with sweet apple chucks all throughout? And a sly undercurrent of mustard giving the whole dish a saucy tang? Now that’s a whole different world of cabbage pleasures altogether (and believe you me, I am very familiar with the cabbage pleasure world, as exotic as it may sound to some). In fact, I liked it so much that, despite this dish being what I first thought to be a clever vessel for some leftovers, I would go so far as to actually buy ham to make it! And that’s not all…if you don’t have any leftover ham, or any ham in general for that matter, you can make this with (wait for it) bacon! Oh yes. – Heat a generous glug of olive oil in a pan large enough to accommodate all the cabbage. – When the oil is hot add onions and garlic and sauté until the onions are soft and translucent. – Add the ham and sauté until the edges are a bit toasty, then add the apple and toss. 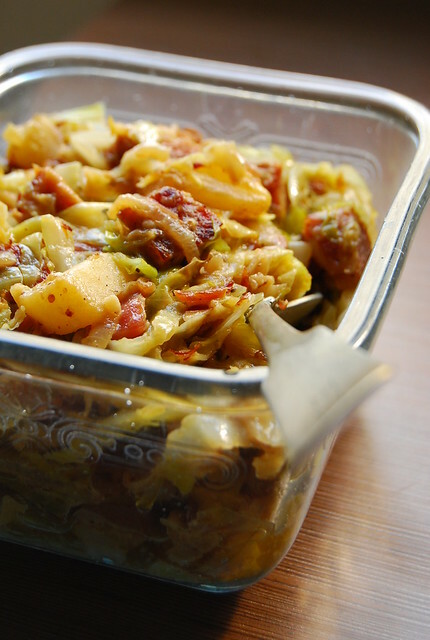 – Add the cabbage and cook until cabbage softens, tossing to make sure everything is cooking evenly. – When cabbage is soft add the cream and mustard and stir to coat everything. Let this simmer for 3-5 minutes, stirring occasionally, so the cream can pick up all the flavors in the pan. Season to taste with salt and pepper. – If you’d like (and I do recommend it!) add a few good gratings of nutmeg. We had this as a side dish with some steak (oof…steak and creamed cabbage…not exactly New Year detox I know! ), but I could have this on its own or with some hot white rice, or tossed with some freshly cooked penne, or even piled atop a thick slice of toasted country bread. Yes, I’d have this any which way and twice on Sundays thank you very much. The quantity for the ham is very flexible – I used what leftovers I had and so can you. Like I mentioned, you can substitute the ham with bacon, but I would suggest using less bacon than the amount of ham I indicated…maybe around 3-4 strips chopped. If you are a cabbage-hater, firstly, why? Secondly, please try this. It’s a New Year and time to try new things. Give old foes a chance to make amends. And it will give you something to do with the leftover ham that stares balefully at you every time you open the fridge. Some News!!! I mentioned earlier that, in line with my resolution to explore new ways to share food with all of you this New Year, I have a special surprise in Yummy Magazine’s January/February 2011 issue (in news stands now! )…My own column! Yummy Magazine has always been one of my favorite local food publications and I have written for them a number of times before, so when they asked me to write a regular column I was thrilled…not to mention giddily flattered! I’ll be sharing simple everyday dishes from my Family Kitchen every month 🙂 Hope you like them! Very yummy looking and sounding! I really like cooking with leftovers and share your enthusiasm for cabbage and ham. Very comforting dish. Wow, Joey! Congratulations on the column! I am definitely getting a copy this weekend. The creamed cabbage sounds so delish… I, too, love cabbage beyond measure. I would go as far as chopping up a cabbage, sauteeing in olive oil and hitting it with nothing but a sprinkle of sea salt. Served hot in a bowl, all I need is a fork – or a pair of chopsticks. Many times I burned my tongue, eager as I am to crunch into it. BTW, thank you so much on your tips on using a tiny electrical oven. I have made lasagna (not a success yet but I'm getting there) and my mom's eggplant casserole. I am enjoying my new relationship with the oven. Thank you, thank you! First off, congratulations with a new column! so fitting! Congrats on the column, that sounds awesome. Almost as wonderful as your cabbage dish today, which would be perfect for warming up after a long cold day like we have here! 5 inches of snow and counting, and temps barely above 25, yikes. I love everything about this dish and hope to make it soon. Thanks! This looks delicious! Congrats on your regular column! Continued best wishes for the new year! I love cabbage and I love ham–I will definitely try this! Thanks Rosa! Happy New Year! Hi Paz! Thank you!! And all the best to you as well in 2011! Hi Chef D! Then you will like this too! Enjoy! Thanks! A quick question: is it possible to substitute chicken for ham, for those of us concerned with fatty meats? I love the way you're making sure to use leftovers. What a wonderful recipe. I loved it and it was more than enough for a main dish. Thanks for recommendation! Looks amazing! I think will try this one out. Congrats on the column! We are still trying to find a way to make you like liver. Hi Mikaela! Thank you 🙂 When it comes to food in general, and leftovers in particular, waste not want not! Hello Weekend Gourmet! I hope you like it! Nice to know a fellow cabbage lover…Cabbage is so misunderstood don’t you think? oh yum!! This looks like one of those homey dishes you could crave yet and yet again!! This looks like a great way to use leftover ham. Hah! We're both dyed-in the wool pork lovers. And congrats for having a regular column in Yummy Philippines! Great way to deal with leftovers, Joey. Might I also suggest a crisp-crusted British bubble and squeak? It's what I did with some leftover ham, cabbage, and potatoes. Hi Midge! Aaah! Bubble and Squeak! Good idea! This sounds so amazing, looks amazing, and has excellent nutritional value. Well done! Hubby made this for dinner tonight….resounding five star recipe!!! Great job! Hi RJ! So glad to hear that! A simple yet magnificent dish! I'll try it at home. Hi Random Kitchen Raider! Hope you like it!